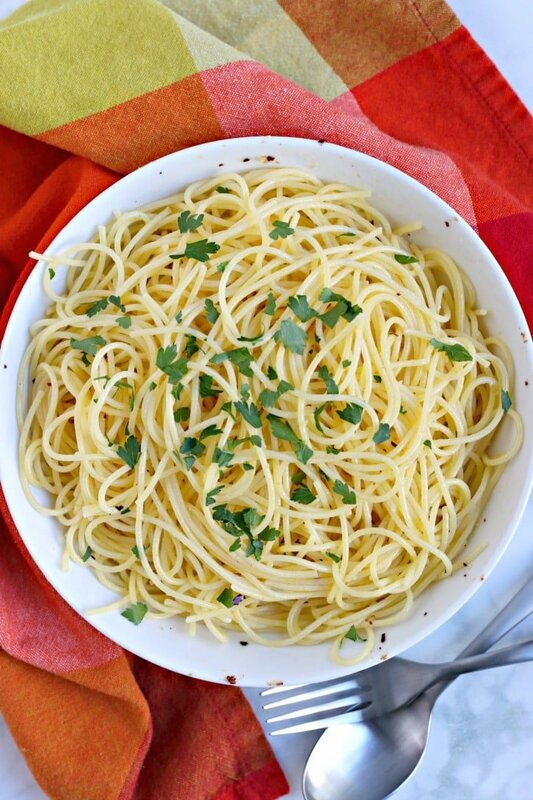 Spaghetti with Garlic and Olive Oil is simple yet flavorful and comes together in minutes. It’s a perfect weeknight dinner when you’re short on time or have little in your pantry. This recipe is naturally vegan and can be made gluten-free. This post is sponsored by Dorot Gardens, but the content and opinions expressed here are my own. Do you ever have those moments when it’s time for dinner, but you haven’t planned anything to make? That’s why I love having some simple recipes committed to memory that can quickly be made from ingredients most people keep in their kitchens. Spaghetti with Garlic and Olive Oil is one of those dishes. And it’s so quick and delicious! Besides keeping pasta on hand, I love having a variety of herbs and spices to make dishes like Spaghetti with Garlic and Olive Oil. There’s nothing like fresh garlic to flavor a dish. But if I’m really trying to save time and minimize cleanup, I love using Dorot Gardens garlic in this recipe. Imagine being able to simply pop out a measured amount of garlic without the need for a knife or a measuring spoon. And since Dorot Gardens freezes their fresh garlic, cilantro, basil, and ginger within 90 minutes of harvesting, you know they are really fresh. Plus they have a 2 year shelf life in your freezer. 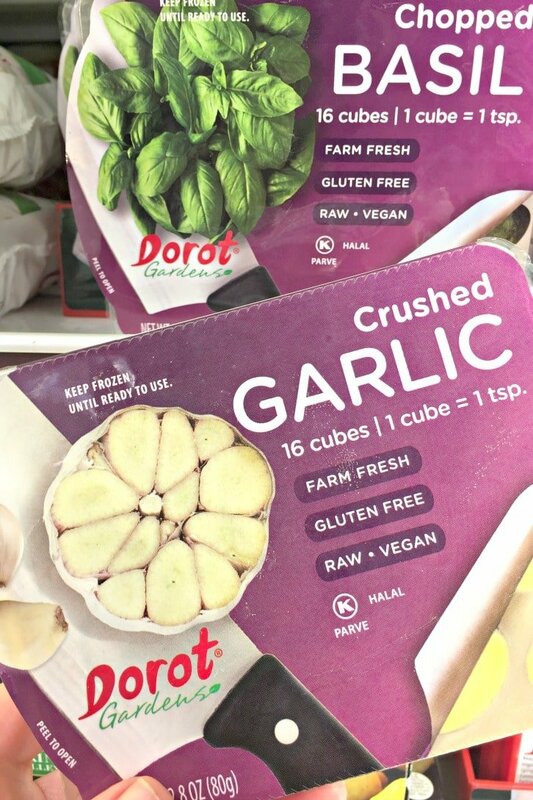 Dorot Gardens Garlic, Ginger, Cilantro, and Basil can be found in the freezer section of your local supermarket. 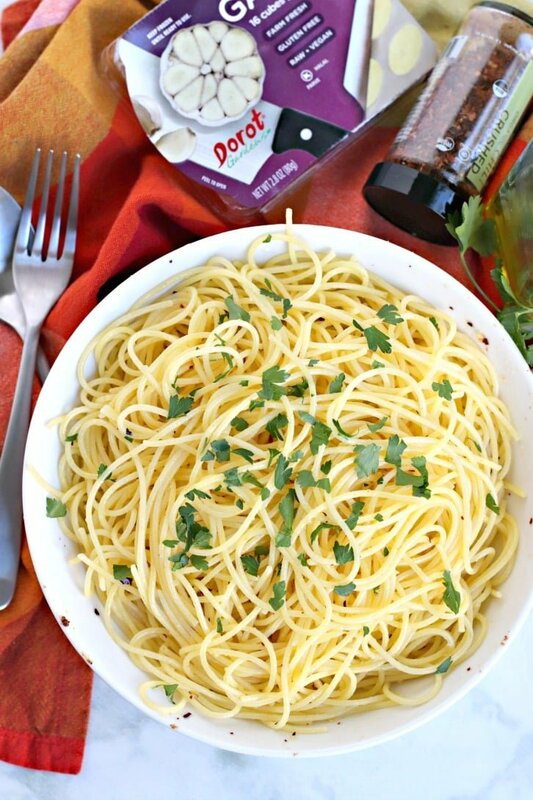 I picked up some garlic at my local Kroger store Ralphs to use for this Spaghetti with Garlic and Olive Oil. They had them next to some international meals like frozen pierogi and Persian entrees. But in other stores I’ve seen them mixed in with the frozen vegetables. Visit the Dorot Gardens website to find store locations near you, learn more recipes, and download a coupon. In addition, I love using the frozen garlic and frozen ginger to make recipes such as Chickpea Stir Fry and Baked Teriyaki Tofu. And the basil and cilantro are perfect to adding to sauces, salsas, and salads. Spaghetti with Garlic and Olive Oil is known in Italy as Spaghetti Aglio e Olio, or in this case, Aglio, Olio, e Peperoncino since we are using red chili flakes. As you may have guessed, the only ingredients you need to make this recipe are pasta, garlic, olive oil, red pepper flakes, and some salt. And if you happen to have some fresh parsley on hand, it makes a wonderful garnish. But if you don’t care for spicy food, feel free to leave out the chili. Traditionally this dish from Naples is served late at night after an evening out, perhaps after attending the opera or other formal event with friends and family. Learn more in the article The Story Behind 5 Classic Italian Pasta Sauces. 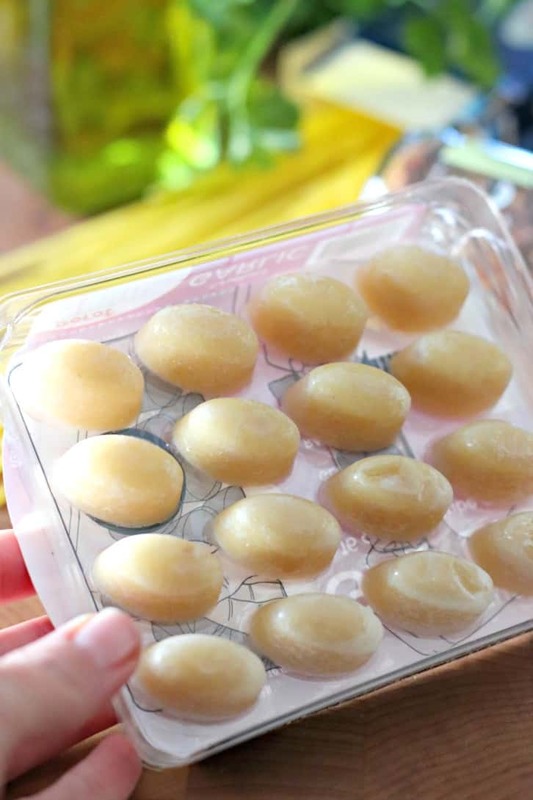 Cook a package of pasta in salted water according to the package directions. Heat some olive oil, garlic, and chili pepper in a small skillet. Once the pasta is cooked, drain it and transfer it to a large serving bowl. Pour the hot flavored oil over the noodles and toss them so each strand is coated. Add some fresh parsley and serve! 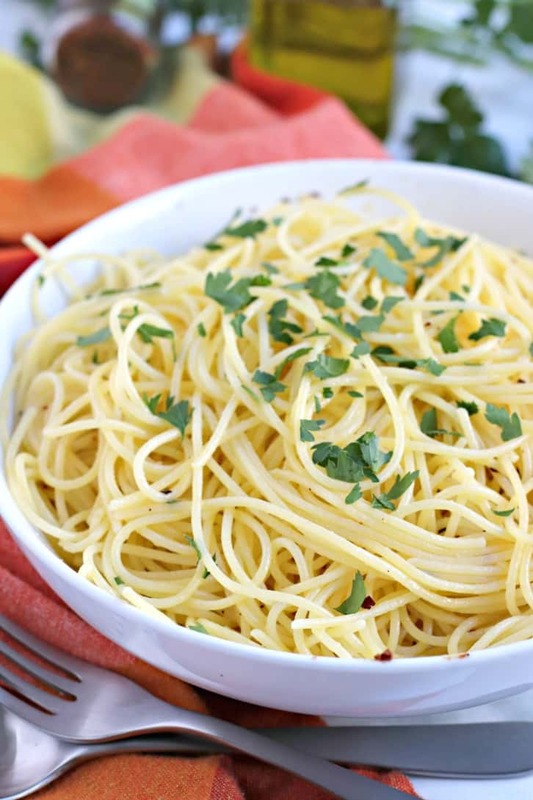 Spaghetti with Garlic and Olive Oil pairs well with many sides. If you have extra time, try serving this pasta with Asparagus Avocado Salad or White Bean Cherry Tomato Basil Salad, which can be prepared in advance. It’s also delicious with Pesto Brussels Sprouts or Mustard Roasted Cauliflower. If you have leftovers, you can store them covered and refrigerated for several days. I like to reheat the pasta in the microwave. And if you love this recipe, please give it 5 stars! 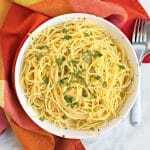 Spaghetti with Garlic and Olive Oil is simple yet flavorful and comes together in minutes. It's a perfect weeknight dinner when you're short on time or have little in your pantry. This recipe is naturally vegan and can be made gluten-free. Bring a pot of salted water to a boil. Add the spaghetti and cook according to the package directions. When the pasta is close to being done, heat the olive oil in a small sauce pan over medium heat. Add the garlic and crushed red chili flakes. Quickly stir and remove from the heat when the garlic appears lightly browned. This should take less than a minute. As soon as the spaghetti is cooked, drain it and transfer it to a large serving bowl. Pour the hot olive oil mixture over the pasta and toss to coat all the noodles. Top with torn parsley leaves, if desired, and serve immediately. If you can't find Dorot Gardens Garlic cubes, you can substitute 2 large crushed or finely minced garlic cloves in this recipe. This is a dumb question because I have never used this garlic. Do I cut up the garlic? Do I leave it in the oil? With the Dorot Gardens garlic, it’s already minced. You just pop it out of the package, and it’s ready! This was so easy and so flavorful. Me, hubs, and toddler all loved it. This will be a definite repeat! can you freeze any leftovers? Hi Heather, I don’t think it will freeze well, unfortunately.